Smart Cat Knocks On The Door to get in! 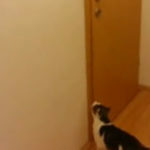 A cute cat knock on the door to let his owner know that he is outside. Asta mai lipsea…sa ai o pisica ca asta si sa o apuce sa bata in usa pe la 3-4 dimineata….te caci pe tine!